After 22 years at Chelsea the 36-year-old became a free agent on Saturday, having won 15 major trophies with the Blues and captaining the club for the majority of that time. 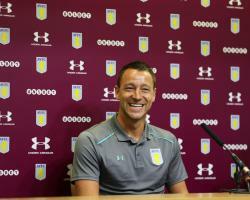 But all that was forgotten the moment Villa produced a viral video to announce the signing of Terry, which was based around an imaginary WhatsApp conversation between manager Steve Bruce, owner Dr Tony Xia and members of the first-team squad. Villa's video caused a stir online, with one fan, @DomH97, saying: "Why do we have to do everything in such an embarrassing way"
Another (@latetackle) simply added: "lads we have so many questions"
However it proved popular with some, with @Ryan_Anacki posting: "This is the GOAT of a signing announcement and it forever will be", while BBC presenter Dan Walker described it as "brilliant"